"A great way to add some zip to your cauliflower. 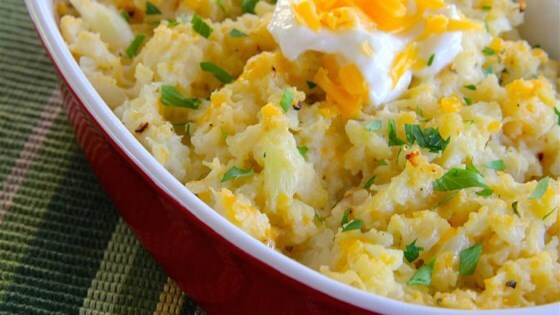 This recipe is low-carb and resembles a loaded potato! Very unique and down right tasty!" Place a steamer insert into a saucepan and fill with water to just below the bottom of the steamer. Bring water to a boil. Add cauliflower, cover, and steam until very tender, 15 to 20 minutes. Transfer cauliflower to a bowl, mash, and strain excess water. Mix cauliflower, sour cream, Cheddar cheese, ranch dressing mix, onion powder, and garlic powder together in a 9-inch baking dish; top with butter. Bake in the preheated oven until bubbling, 30 to 45 minutes. The first few bites were great, but the flavor got rich too fast. I skipped the sour cream and used a hint of ranch dressing (maybe a tablespoon). I may make again, and I'm glad I tried it! This recipe was really good. Thoroughly enjoyed it and a great way to eat cauliflower! I made it without the ranch as it sometimes has MSG in it. And added 1/2 tsp of paprika for color. yum. Great side dish! I did not mash the cauliflower and it turned out great. Otherwise, I followed the recipe exact.